Hey, Vigilantes, Alicia here. I’m excited to introduce you to Laura Gore, the newly appointed Treasurer of Vigilante Kindness. If you followed along when I was blogging at Pedals and Pencils, you know Laura as That Laura. As in Laura who teaches archery to blind kids? Yes, that Laura. Laura who once inherited a cat named Little Baby Jesus? Yes, that Laura. Laura who convinced me to ride 200 miles from Seattle to Portland? Yes, that Laura. That Laura also loves making spreadsheets and analyzing and collecting data. All I have to say about that is thank God there are people out there who speak math. Here’s a little more about Laura. In Real Life: Laura has been on both sides of funding streams, working for funders as well as grantees. Currently she works as a Research Program Specialist with the California Department of Health and Human Services. Laura enjoys spending time at home with her two hilarious dogs, Skeeter and Sting. She also loves to travel and once took road trip with the sole purpose of seeing the longest continuous burning lightbulb, the site of a crashed UFO, and the Computer History Museum. Gifts & Talents: Laura finds crunching numbers fun and is used to receiving strange looks when she gets excited and rambles on about data. Her other gifts include seizing opportunities, hunting down answers, and being very, very persuasive. Things You Never Needed to Know: Laura was a competitive archer and has taken first at many archery shoots. She has ridden a bicycle from Hue to Ho Chi Minh City, Vietnam with her father. She once served a two-minute stint in solitary confinement at Alcatraz. Hey, Vigilantes, Alicia here. I’m over the moon to introduce you to Colin Higbee, the newly appointed Secretary of Vigilante Kindness. Colin put up with me for a whole month on my very first trip to Uganda, so what he didn’t mention in his bio is that he is also a saint. Here’s a little more about Colin. In Real Life: Colin is a lifetime educator. He currently serves as a School Support Specialist with the Oklahoma State Department of Education. Prior to working with the SDE he has been a Guidance Counselor, Teacher and Camp Director in Oklahoma City, Colorado, Oregon and Alaska. He is an avid traveler and feels very fortunate to have taken part in several epic road trips. He’s also grateful for the month he spent meeting amazing people in Gulu, Uganda. Colin is married to his best friend, Lauren. Gifts & Talents: Colin’s talents include photography, writing, teaching, and the ability to fall asleep in any situation. Things You Never Needed to Know: Colin can wiggle his ears. He once shook hands with George H.W. Bush. He can perform cut down rescues from challenge courses and among certain circles he goes by Chigbee. Read more about the fantastic collection of people we call our Board of Directors here. It’s Monday and you deserve a sweet story. How about one about Leku Ivan, the painter kid in Uganda who uses the money from his paintings to buy his sister new dresses in the absence of their parents? The paintings of artist Ivan Leku, 19, may not ring a bell on the first look. They may seem like any other paintings, like the ones for decorating our rooms or office walls. But on closer and careful observation, one gets fascinated with beautiful graphical illustration of the abstract paintings in acrylics. The paintings send a striking message about the lives of the African street children, of children living a deplorable life, yet covered with jolly faces. Leku says art has been his passion since childhood. He acquired practical art skills from Jinja Art shop, where he had been undergoing training in abstract and landscape paintings. “Even in my childhood, no one thought I could be an artist. But because I had people around me who believed that art was what can earn me a living, they groomed me and today, they appreciate my skills,” says Leku. He began commercial painting in 2010. With Shs400,000, he rented a room in Gulu Town, which serves as his work station. In order to reduce the rent he pays, he shares the room with two other artists. On how and where he sells his products, Leku says it is mostly at exhibition shows, trade fairs and hotels, targeting mainly foreign customers who seem to be more interested in his art pieces. He says some of his clients constitute foreigners, who place their orders and have their goods sent to them and the money sent to him through Western Union. Leku says he intends to turn his workshop into a free training class for street children, whose lives, he says, are considered wasted. “I want these children to learn practical art skills for their future life sustenance,” says Leku. Those foreign clients who place orders and send money via Western Union? That’s you, sweet Vigilantes. You’re making a difference in Ivan’s life. In turn, he’s sharing his heart and his talent with street kids in Gulu. Want to buy one of Ivan’s paintings? Click here to see a handful of his remaining pieces and the paintings of the other artists who share his shop. The elephants of Te Okot were tromping through my mind today. A few weeks ago, I received a mini grant that allowed me to purchase 23 solar lights from Unite to Light, the same company I purchased solar lights from last year. 23 more solar lights for Te Okot. 23 solar lights that will not be fire hazards in their huts. 23 solar lights that won’t accidentally set their mosquito nets on fire. 23 solar lights that won’t require families to purchase kerosene and then breathe toxic kerosene fumes. 23 solar lights to keep the wild elephants at bay. It’s that last one that gives me goosebumps. You might know the story already, but if not, let me get you up to speed. The people of Te Okot are sustenance farmers, meaning the food from their gardens is what they eat. It’s not like there’s a grocery store down the block. A garden = food = life. So you can imagine what, quite literally, a large problem it was for the people of Te Okot to have wild elephants come and devour their gardens at night, not to mention the acute fear of having wild elephants trample your hut and your sleeping family inside it. The solution was an elegant and, for me, an unexpected one. Now on nights when the elephants come near, the people of Te Okot turn on their lights and place them outside of their huts. Elephants associate light with the lights on the scopes of guns, so when they see the lights, they lumber away, leaving the people of Te Okot and their gardens safe and sound. All of those things would be enough, more than enough, but, dear ones, this is not a story of just enough. 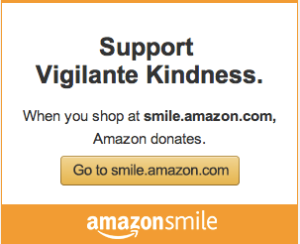 This is a story of Vigilante Kindness from unexpected places and of a company who shows their heart through their actions. Return the lights and they’d reimburse me for postage. Keep the lights for free and give them to an organization to distribute and then report back to Unite to Light who I gave them to and where the lights will be used. The idea of sending the lights back broke my heart, but I didn’t have a spare $250 lying around to buy the extra 23 lights either. Unite to Light gives generously to non-profit organizations all over the world. We’re not a non-profit, not yet. So I did the only thing that made sense to me, the same thing I did when I didn’t know how to get clean drinking water for Te Okot. I wrote back to Unite to Light and told them the story of solar lights and elephants and the people of Te Okot. I told them about our little rag-tag organization, Vigilante Kindness, and that we don’t have our official non-profit status yet. I told them that it would be an incredible gift to bring the extra lights to Te Okot in July, but that I understood completely if they couldn’t do that because of our status. My email was forwarded to the President of Unite to Light and her response still makes me get all teary-eyed. Your story is so intriguing. I am glad that you will be able to take the extra lights with you and deliver them to the people in Uganda. You are brightening lives and we thank you. Sometimes our mistakes work out for the best. Twenty-three more lives will be positively affected with those extras. Blessings to you for the work you are doing. I love the line, “Sometimes our mistakes work out for the best.” I’ll say. 23 46 solar lights for Te Okot. 23 46 solar lights that will not be fire hazards in their huts. 23 46 solar lights that won’t accidentally set their mosquito nets on fire. 23 46 solar lights that won’t require families to purchase kerosene and then breathe toxic kerosene fumes. 23 46 solar lights to keep the wild elephants at bay. So now when the elephants of Te Okot tromp through my mind, I’ll smile and think of 46 more shining solar lights, peacefully keeping the people, the gardens, and even the wild elephants of Te Okot safe and sound. 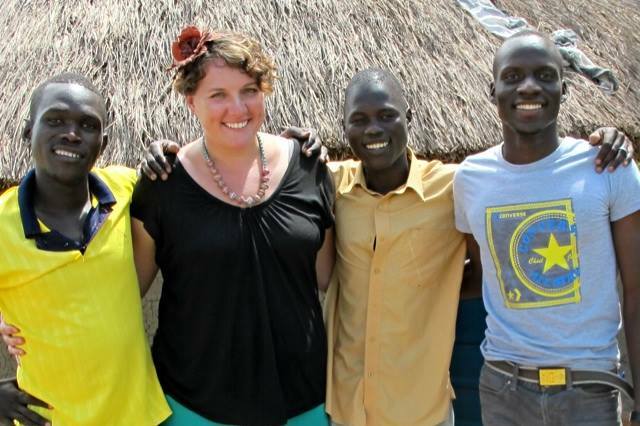 Want to help bring light to people of Te Okot and the students of Northern Uganda? Click the PayPal link below. You could be light number 47. Yesterday I wrote about how God makes beautiful, new things out of old, wrecked things. What got me to thinking about this in the first place is this little Vigilante Kindness Paper Bead Jewelry Project that’s in the very baby stages. This project started with a conversation with my friend Denis about his wife, Vickie, and how she wants to be a businesswoman. Vickie and some other women in Te Okot know how to make paper bead jewelry. In fact, some of the men, including Denis, know how to make beads, too. I wanted to bring Vickie a gift the next time I went to Te Okot, so I bought her some jewelry making tools and supplies. The one thing that had me stumped was where to get the paper. Slick, shiny, colorful magazine paper would work best, but it’s not like there’s a magazine stand on the corner in or anywhere near Te Okot. I can think of two bookstores in Gulu. They carry textbooks, dictionaries and Bibles. Earlier in my trip, I’d stopped at the stationery store and picked up two blank sheets of poster paper to use in the poetry workshops I was teaching. The posters were baby blue because that’s the only color the stationery store had and I bought their last two sheets. I penned George Ella Lyon’s earthen poem Where I’m From on the posters, my handwriting slanting perilously downward as I wrote the words in pungent, permanent black ink. I took these posters back and forth with me to class, rolled up in my backpack as I rode on the back of a boda to school, then taped with duct tape on the makeshift blackboard and finally rolled back up into my backpack at the end of each class. By the time the writing workshops came to an end, my posters were covered in chalkdust from all the notes we added on the board around the poems. The edges of the posters were red with the dust that blew into the classroom and also kicked up underneath the tires of the boda. They were splattered with mud from puddles of fresh rain and polka-dotted with water spots from the rain itself. My tattered posters were destined for the trash, that is until I found out that Vickie needed paper for jewelry making. The posters weren’t the slick, colorful magazine paper that’s best for bead making, but they were what I had. This seems like a lesson I have to learn over and over again. What I’ve got to offer is enough, even when it’s tattered and splotched with mud. It’s enough. I passed off my poster to Denis who took it home and made beads with Vickie. By the time I returned home, my mud stained, used up poster had been made into beautiful beads. I love these beads because they’re proof that stained, wrecked things can be made new. Broken, wrecked people like me can be made new. That’s another lesson that I have to keep learning. Maybe the broken, wrecked parts of you need that whispered in the cracks, too. I love these beads because poetry is tucked into them. The black parts of the beads are my lopsided scribblings of George Ella Lyon’s gorgeous words. I love these beads because the lighter parts of the beads are the water spots from a day when I was caught in a rainstorm, drenched down through all the layers of myself. Most of all, I love these beads because they mean that Vickie and the women of Te Okot get the opportunity to be a businesswomen who are able to earn money and feed and clothe their children. When I return to Te Okot in July, I’m bringing Vickie a suitcase full of magazines. Your magazines and my magazines, once destined for the trash, or the recycle bin at best, will be made into jewelry. Second chances never looked so beautiful. Maybe it’s because it’s the start of a new year, but lately I’ve been thinking about new things. Well, actually I’ve been thinking about how God makes old, and sometimes wrecked things, into beautiful, new things. Yesterday afternoon I was thinking in particular of the woman in John 8. For those of you unfamiliar with the story, here’s the speed dating version. One morning Jesus went to the temple. Swarms of people followed Him because, you know, He’s the Son of God and they were smart enough to recognize that they should listen up. (Hang on, I’m making a mental note to myself to be as smart as they were.) So Jesus sits down with the swarms and starts teaching them. Then these religious scholars and Pharisees drag a woman into the temple. They’d caught her in the middle of sleeping with someone who wasn’t her husband and by many accounts was in fact someone else’s husband. So they stand her up in front of the crowd and tell Jesus that this woman should be stoned to death because she’d broken the law as given to Moses. Not a peep to the religious scholars. Not a word to the crowd of people. Not a single syllable to the woman. He bends down and with His finger starts writing in the dirt. Who knows what. Maybe He’s writing out their names and sins. Maybe He’s writing out the names of the prostitutes the religious scholars had been visiting as of late. Maybe He’s writing out all the good things He sees in this woman. There are lots of speculations, but nobody seems to know for sure what He scribbled in the dirt that day. The Pharisees pester Jesus and He tells them, go ahead, whoever is sinless can pelt the woman with the first rock. Then He goes back to writing in the dirt. Now, you and I might believe different things and that’s fine with me, but one of the things I believe is that God and Jesus and the Holy Spirit are all part of the same being. That means the same God who made Eve, the same God who made the very first woman out of dust and bones way back in the beginning of it all, is the same God who was writing in the dirt on the day this other woman was dragged into the temple. I wonder if while Jesus was writing in the dirt if He remembered that other time His hands were dirty. I wonder if He reminisced about sculpting Eve’s heart and the mud under His fingernails as He crafted her shoulder blades and made tiny mud pie toes. I don’t know if Jesus was thinking of Eve while He was writing in the temple dirt. I like to think He might have been thinking of how when He created womankind in the form of Eve, He created her and she was flawless and new, bursting with possibility. I think Jesus sees that Eve in all of us. The Eve before the apple, the Eve whose first breath came straight from the mouth of God. Even when we lie. Or let bad words fly. Or glut frosting out of the jar for breakfast. Or cut each other to the quick. I think God still sees brand spanking new, bursting with possibility Eve in us. Even when we’re standing naked in the temple, clothed only in the absolute worst version of ourselves. Jesus sees something different, someone flawless and new, someone He made out of dust and bones. After Jesus tells the scholars and Pharisees that the sinless person can pitch the first stone, the Pharisees and the religious scholars walk away. I wonder if they had the rocks in their hands. Imagine the thud, thud, thud of all those rocks dropping to the ground as they walked away. It’s the sound of a second chance. With all the Pharisees and religious scholars gone, this woman was left in the presence of Jesus. And maybe the swarm of people He was teaching. I’m not entirely clear on that. So there she is with Jesus. Can you even imagine being near Jesus when you were just ripped from bed with someone who is not your husband? I don’t know about you, but I’d have been simultaneously sweating bullets, peeing my pants and crying, ugly crying. But Jesus in all of His goodness and grace simply asks the woman if she sees anyone left accusing her. She somehow summons her voice from the pit of her stomach and tells Jesus that there’s nobody left to accuse her. And Jesus tells her He’s not accusing her either. He tells her to go on her way and stop sinning. Did she stop sinning? Nobody knows. If she’s anything like me, she probably tried her best and blew it a lot along the way. Here’s where God’s grace leaves me undone. Even when we are at our worst, God doesn’t want to point His finger at us, to poke His finger in all of our tender, shameful places. He doesn’t want to stone us to death with our mistakes. He wants to sit down, get His hands dirty and stay there with us until there’s nobody left with rocks aimed for our heads. Then he wants us to walk a new path, one bursting with possibility. Sometimes I’m the woman in this story, but more often than not, I’m the one pointing my finger and picking up rocks, as if judging your flaws somehow lessen mine. I’m not sure I’ll ever be able to see people all fresh and new the way God perpetually does. But this I know for sure, when I see someone wrecked and tangled in the sheets of sin, I’m going to do my best to be quiet, drop my rocks and wait it out in the dirt with them. What a world it would be if we all just dropped our rocks. It’s no secret that I hate birds. I’m talking the fire of a thousand suns kind of hatred. Just in case you’re thinking my bird loathing isn’t justified, let me send you on a little trip down memory lane to the day a wild turkey chased me to school. See? I hate birds and they hate me. Fair is fair. Last summer, with just a few days remaining in Uganda, my three boys set an official meeting with me. They’d been having “brothers only, no mother” meetings without me for a few days, so when they set this meeting with me my interest was piqued, to say the least. I’m new to this parenting thing and I was a little nervous. They’re not biological brothers. Being brothers is as unfamiliar to them as motherhood is to me. We’re all still working out the kinks of our unlikely family. The day came for our meeting and we sat outside at a table, drinking pineapple Merinda. My boys began to speak. They told me how grateful they are that Terry and I support their schooling and how grateful they are that we do so much for them. They also told me how difficult it is for them to ask for our help, especially because they know we’re supporting all three of them. I didn’t have much of a response except to say that I understand how difficult it is to ask for help. Most days, I’d rather die than admit I need help. They continued, telling me that they’d developed a business plan so that they could begin to pay their own school fees and pay for other necessary items like books, food and clothing. I took a deep breath. Young boys with a business plan sounded like bad news to me. I had “No” ready on my lips. Then they pulled out photocopies of their business plan and I knew they were serious. Typing up the plan on a computer and then making copies isn’t that easy when you don’t have access to things like a computer, a copier or regular electricity. Martin, my middle kid who named me Lanyero, went over their plan in detail and I couldn’t help but giggle. My boys had created a beautiful business plan to start a chicken farm. A chicken farm, proof positive that God has a wicked sense of humor. They even named it: Lanyero and Sons Broilers. Lanyero means “joyful”. The literal translation means “laughter”. And, Lord have mercy, did I cackle at the thought of starting a chicken farm in Northern Uganda. What brings me joy about their plan is that they want to tithe a portion of their chickens and eggs to local organizations that take care of people with disabilities, widows, and orphaned babies and children. My formerly orphaned boys want to help care for orphans. And just like that my heart melted. So as people around me are making New Year’s resolutions to get healthy, get organized, get out of debt, I-the girl who is petrified of all things feathered-am making plans to get chickens. Wanna help make the chicken farm come to fruition? Here's your chance.